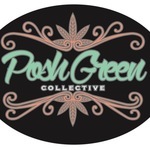 Posh Green Collective is a women-owned business. It provides customers with the best medical marijuana strains, oils, edibles and other cannabis-based medicine. The collective offers a wide product selection and upscale client service that you can trust. The company�s collaboration with reliable suppliers ensures that its patients receive the best-quality strains to address their medical needs. The assortment includes the finest quality cannabis, oil, wax, concentrates, edibles, gear and prerolls. The best growing, extraction and baking practices and techniques are used to guarantee the high standards and outstanding quality of each product. What is more, the company is constantly working on adding new types of strains and flavors in accordance with customers� needs and preferences. The staff at Posh Green is always accessible to reply to your queries and help you choose the appropriate medication. The firm offers discreet packaging and delivery. It thoroughly checks the package before sending to ensure its contents remain undetectable until unwrapped. Posh Green delivers to San Francisco. It also covers SFO, S. San Francisco, Portola District, and Treasure Island for extra $5.00 fee.